I have a pile of busted up concrete in my backyard that I needed to do something with. I tried busting it up with a sledge hammer, but that was brutal. I got more beat up than the concrete. don't have a place to bury it, and it isn't pretty enough for a 'feature'. Right now it is just piled in a remote corner of my backyard. 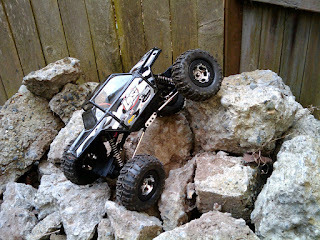 I bought a Losi Mini Rock Crawler! This little guy is much different than my RC18MT. The RC18 is a quick little guy, able to do spins, jumps, and even the occasional wheelie. My MRC can't... It barely moves at a walking pace. I showed it to Carrie and her first words were, "Is that as fast as it goes?" Where it shines is climbing stuff, especially rocks, hence the 'rock crawler' in it's name. Rock crawling involves strategy. What line are you going to take? You don't just point the truck at the pile and gun it. You can, but it is boring (it moves at a walking pace) and most of the time it'll end up on it's top. As you are creeping up the pile you are constantly cranking the wheel back and forth, looking to place a tire in specific places so you don't get high centered or roll. Much like I wrote here a while ago, I get as much out of tearing these things apart as I do driving them. It's like wrenching on a big vehicle except cheaper, less bloody knucles, and I can do it all on my workbench. It's kinda sad in a way. I'm kinda like a kid with no friends. Just me and my dog in the backyard. I coax Carrie out to show her something, but she just rolls her eyes and sneaks back inside as quick as she can. I think I am on my way to being a recluse. Sure, I could befriend kids in the neighborhood, but that is creepy. There was a guy in my neighborhood growing up that did that, and last I heard, he is a woman now. I don't need to go down that road!